Three generations of the McDonald family were photographed together Spring of 1945. Charles Eugene McDonald traveled to Erie from his home in Pittsburgh, Allegheny County, Pennsylvania. 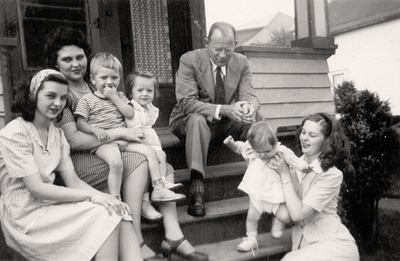 He was photographed with several of his nieces Mary Eugenia, Kathryn Joan and Eleanor Lucille McDonald - the daughters of his brother Loraine Anthony McDonald. Charles was also photographed with great nephew James Arthur Murosky and great nieces Barbra Jean and Mary Helen Murosky - the children of his daughter Mary Eugenia McDonald. The first photograph shows the group on the front porch of 638 East 23rd Street in Erie, Erie County, Pennsylvania. 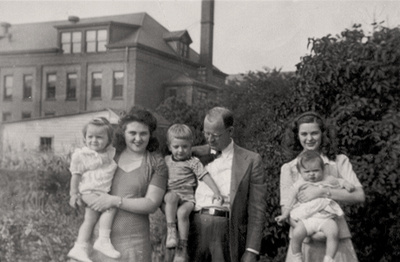 Left to Right: Kathryn Joan McDonald, Mary Eugenia McDonald holding her son James Arthur Murosky, Barbara Jean Murosky, Charles Eugene McDonald, Eleanor Lucille McDonald holding Mary Helen Murosky. The second photograph was taken in the backyard of 638 East 23rd Street in Erie, Erie County, Pennsylvania. The former Holy Trinity School is the large brick building in the background. The photograph is from Frances Philomena Selker Collection. Frances' daughter Mary Eugenia McDonald ended up with her mother's photo collections which is time were handed down to me. Photographer Unknown. Editing and digital restoration by Michelle M. Murosky. Charles Eugene McDonald is my 2nd great uncle. Mary Eugenia McDonald is my paternal grandmother. Kathryn Joan McDonald and Eleanor Lucille McDonald are my great aunts.